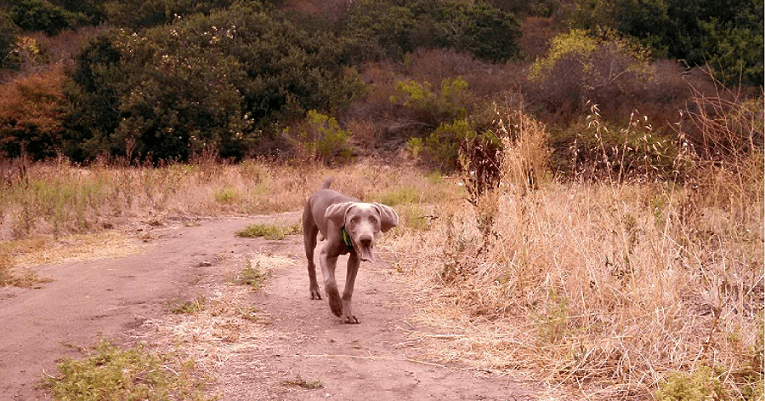 I have an active, young Weimaraner whose parents and grandparents are working, competitive hunting dogs. While my guy is very much a beginner when it comes to field training (and so am I), I’ve learned about some of the important safety tips for training a hunting dog. Please list your own tips or tricks in the comments below. We’d also love to see a picture of your hunting dog! 1. Train with a mentor or club. If you’re brand new to fieldwork, it’s so helpful to team up with a trainer, mentor or club in your area. 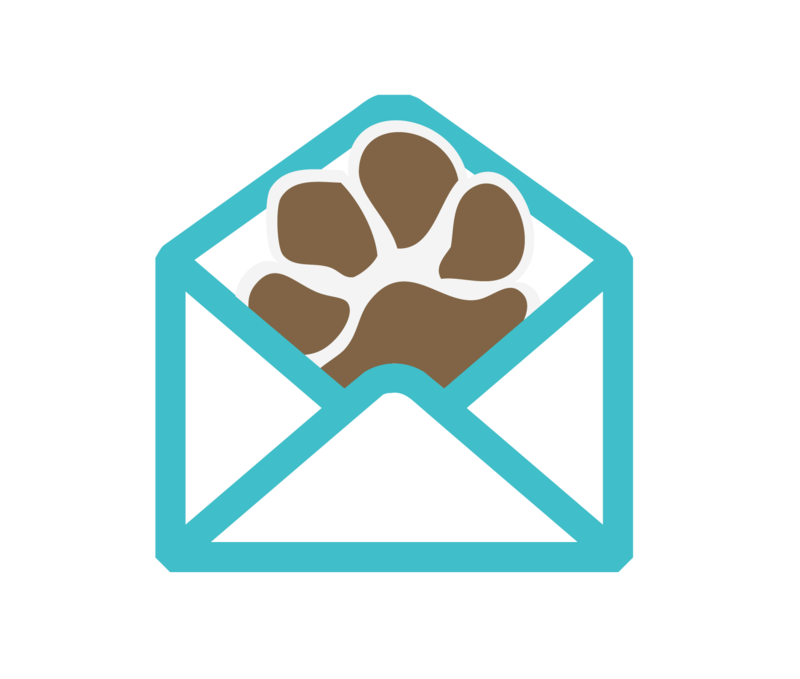 Your dog’s breeder might be able to put you in touch with a trainer or help you get registered with a local training club. I signed my dog up with a local chapter of the North American Versatile Hunting Dog Association (NAVHDA), which is a nonprofit with a reasonable yearly membership fee. The group has monthly training days in the field for dogs of all abilities. 2. The right gear – you and your dog should be seen! You’ll probably want to wear some blaze orange yourself, at the very least a hat or shirt. 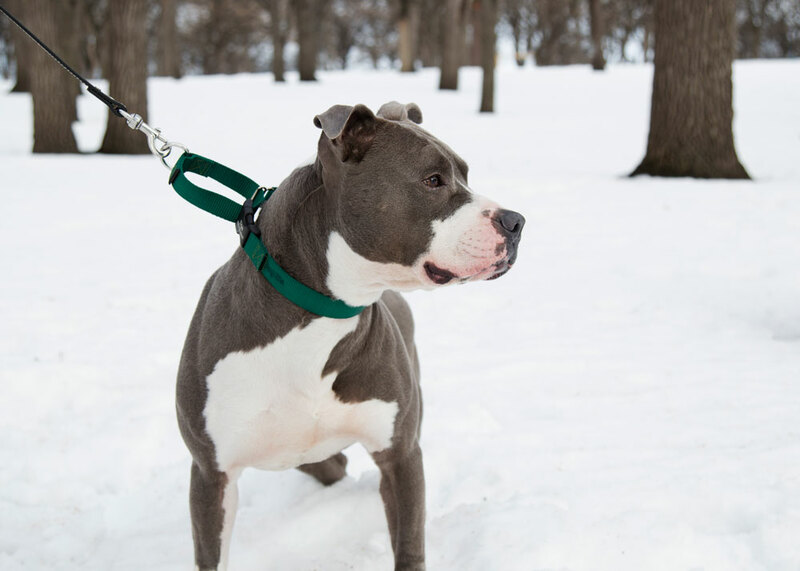 Look into a bright collar for your dog too so he’s not mistaken for a deer or other animal. dogIDs has the new Stealth collars. These are practical collars perfect for hunting as they are waterproof, smell proof and come with an engraved nameplate made of black matte hardware. 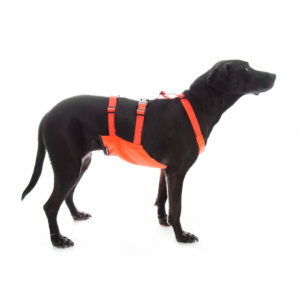 dogIDs created the matte black hardware so that the hunting collar won’t shine at all when you’re hiding with your dog. The hardware is still made of 100% corrosion-proof stainless steel. 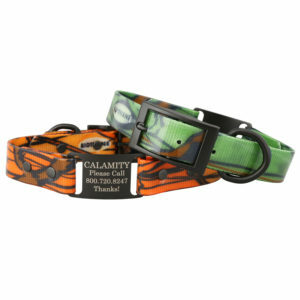 The Stealth collars come in four camouflage colors: turquoise blue, pink, orange and green. You’ll likely be doing off-leash work with your hunting dog eventually. We all know how important ID tags are but it’s still worth repeating. If you prefer to avoid the “jingling tags” during hunting, that’s another reason to look into the Stealth collars from dogIDs as you can engrave up to 4 lines of information right onto the nameplate. No more jingling! 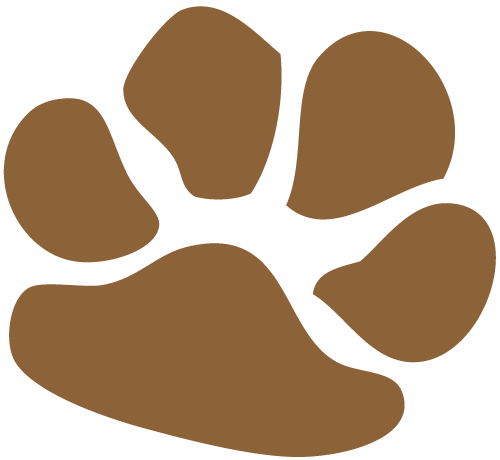 If you hunt in areas far from where you live you might even choose to put different information on your dog’s hunting collar vs. his regular collar. Perhaps a different emergency contact, the address of where you typically stay, etc. I also use the 30-foot Mendota check chord for training my young dog because he can’t always be trusted off leash and unfortunately some areas have enforced leash laws even for hunting dogs. 4. Familiarize yourself with the wildlife. Depending on where you’ll be hunting or training, there may be snakes to worry about certain times of year and of course fleas, ticks and mosquitoes. It goes without saying, but we should all be aware of which large mammals are in the area too whether it’s bears, mountain lions, elk, moose, coyotes, bobcats, etc. And don’t forget plants. Is there a potential for poison ivy? Poison oak? Unfortunately, in my area (southern California) we have a lot of foxtails to deal with which are a huge pain for dogs! 5. Common sense people don’t always follow. We all know the basic safety tips, but we don’t always follow them, do we? Bring plenty of water for yourself and your dog, especially if it’s going to be extra hot or sunny. I like using a collapsible dog bowl. Tell someone where you’ll be, especially if you and your dog are hunting by yourselves. Do you have any gear you’d recommend? Great tips! Also, pack a first aid kit that can be used for both you and your dog. Excellent tips.I am so much benefited from this post.I hope we will get many helpful articles in future.Thank you so much. Thanks for the great tips for hunting dogs. My brother is a big into hunting, and he wants to get a dog for it. I’ll let him know that it’s best to have the dog he buys trained with a pro, and maybe look for a NAVHDA group. can you please help me anyway? Thanks for the great tips. What have you currently tried with Jim? Keeping a canine first aid kit handy, along with a thermometer, is important in case of emergency. If you notice your dog constantly panting, make sure to take frequent water breaks and water dips (in ponds without blue-green algae.) When in doubt, always play it safe and give your dog a break to cool of.